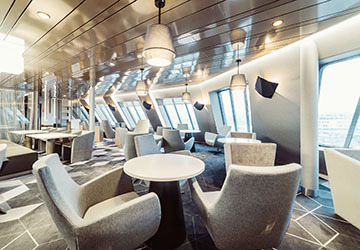 The Megastar is the newest ship in the Tallink fleet and has been operating since the beginning of 2017. The 212 metre vessel can accommodate 2800 passengers and reach speeds of 27 knots. The garage area has been specially designed so you can carry goods from duty free to your car and has a capacity of 150 vehicles. 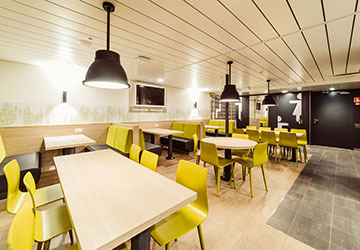 This fantastic new ship has a huge rage of facilities to ensure a smooth and enjoyable sailing for all ages. There numerous food outlets, lounges, a state of the art shopping outlet, business areas and a wide range of accommodation options for those who want a little more luxury. 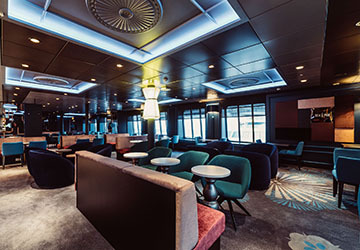 This state of the art new ship has 47 cabins for passengers, as well as specially catered accommodation for disabled travellers, those with allergies and people making the trip with their furry friends. All come with comfortable seating and bedding, as well as plush bathroom areas. Megastar has more than one lounge option for you to take advantage of. The Comfort Lounge is a separate area with services including Televisions, Wi-Fi and power outlets. As well as this you will be provided with a range of snacks, beverages and newspapers. Based on aeroplane business class, the Sitting Lounge provides luxury seating in comfortable armchairs. The quiet and closed area includes TVs and luggage lockers. On deck 11, there is a separate Drivers’ Lounge for cargo drivers. Services available there are included in the ticket price. You will be spoilt for choice for culinary delights while making your Baltic crossing. There is ample available options ranging from sit down three course meals to grabbing a quick snack on the go. The Chef’s Kitchen provides a sit down restaurant with a warm ambiance and a menu that caters for all tastes. 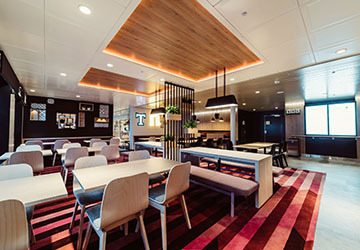 The fast lane provides made to order food in quickly and the Burger Restaurant provides freshly baked buns with tasty ingredients. You don’t have to miss out on the big sporting events whilst you travel. The Victory Bar pairs big screens showing the blockbuster matches with a wide range of beverages and bar snacks. It also has a games room and slot machines. There is also the Sea Pub and Coffee Shop on board. 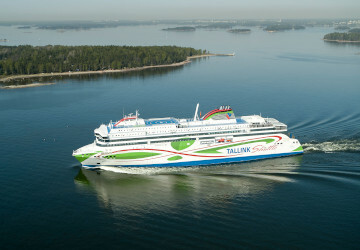 This brand new vessel contains the biggest shopping mall on the Baltic Sea and can be found towards the stern of the ship. 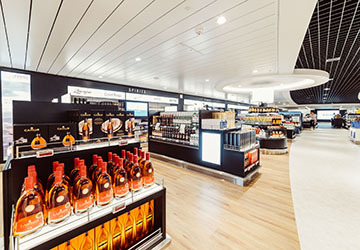 Located over both Decks 7 and 8, the 2800 square metre Traveller Superstore contains a perfume and cosmetics area, clothing, toys, confectionery, a deli counter and a wide selection of alcohol. 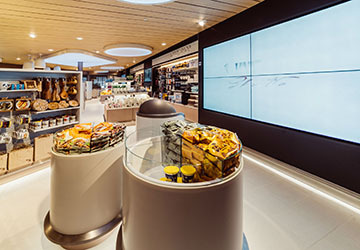 As well as the main shopping area located on Deck 7 there is a smaller Lobby Shop. Here smaller items such as magazines, newspapers, souvenirs and food and drinks are available for purchase. 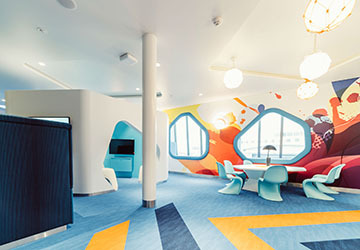 Young voyagers can enjoy the Children’s Playroom on Deck 9 whilst they travel. A play area, TVs with cartoons and games consoles are here to keep the little ones occupied. B-class cabin accommodation allows disabled travellers to enjoy comfortable and relaxing surroundings whilst making their Baltic crossing. The ship is specially adapted for those with restricted mobility. Please Note: Whilst we have taken great care in making our Megastar guide as accurate as possible, onboard facilities, services and entertainment may vary depending on the date and time of year that you travel, facilities mentioned may change without notification and ferry companies reserve the right to operate vessels other than those mentioned at time of booking without prior notification. I wish the trip was longer just to enjoy more time spent on this boat! Everything was so perfect as I expected. We were very impressed with the ferry and thoroughly enjoyed the experience.